The evolution of the information society in recent years has been drastic, and the evolution of the mobile system typified by the iPhone and the smart phone has greatly changed the information environment of consumers. The essence of the corporate management information system does not change, but with the progress of science and technology surrounding computers, the establishment of a "cloud environment" inside and outside the company, and the method of utilizing increasing "big data" are drawing attention. 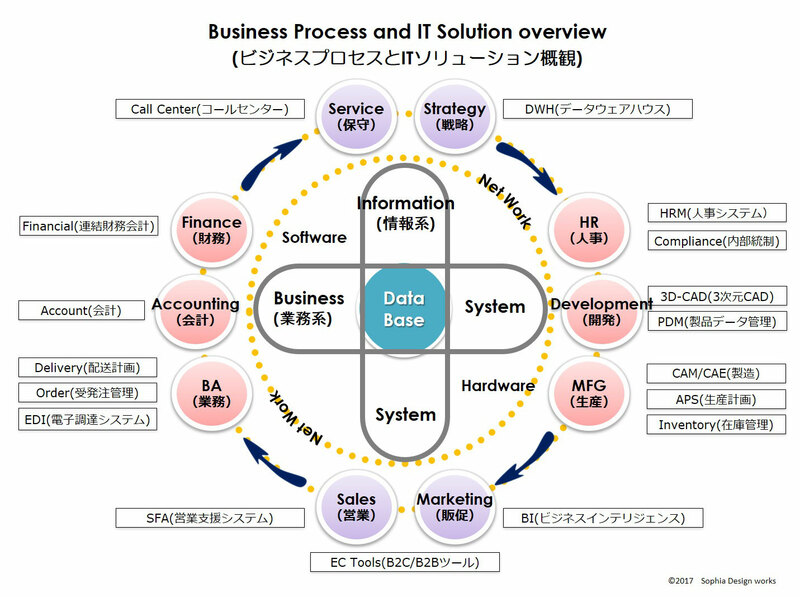 Although the information environment will change due to the evolution of science and technology, it is possible to grasp the overall picture by considering the business process of enterprise management as circular and the information system as cross. As this is considered subjectively, third parties may come up with different shapes. Initially, the data processing of the administrative system was computerized, and the system of business eventually began to be utilized. Since manufacturing, production, sales, ordering, logistics, financial accounting located in the lateral direction are closely related critical operations, it is called "business-based core system" and is applied to applications such as MRP, ERP, SCM It has evolved. Especially in business such as financial transactions, stock price information, delivery information etc., the ability to update accurately and quickly is required. On the other hand, we accumulate necessary information in time series and analyze customer purchasing trend and market trend and information system which utilizes it in marketing and sales strategy also was evolved. 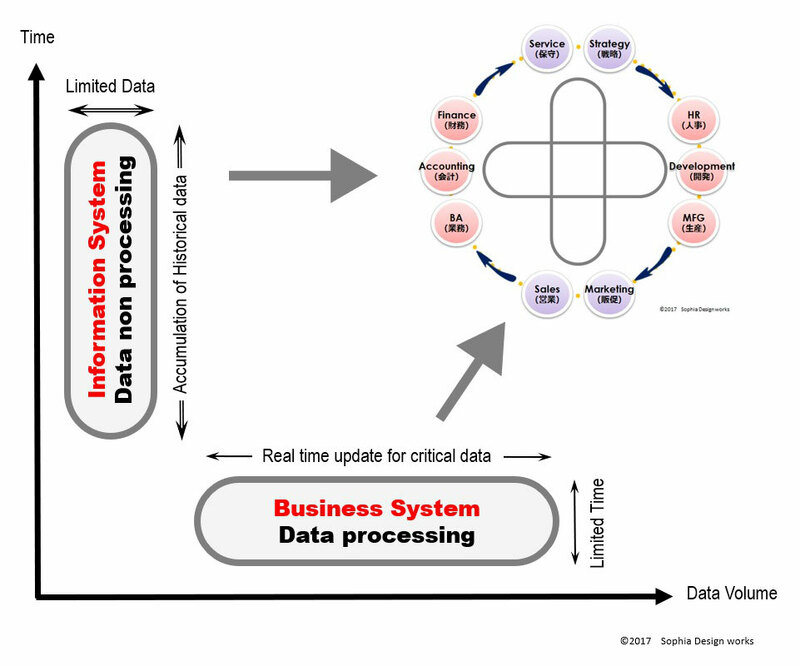 Unlike the core business system, the information system is characterized by accumulating data without updating it. 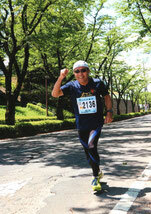 I will illustrate these two systems by "time amount" and "information amount". ● Because the information system "accumulates necessary information for a long time in a large amount", it becomes easy to understand by placing it on the vertical axis. 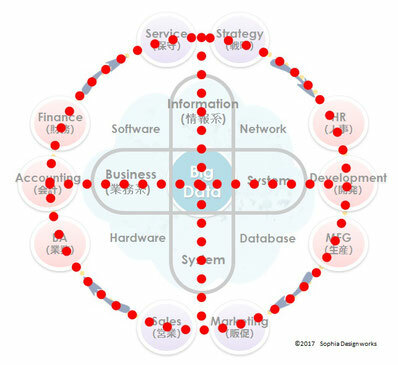 By placing these two systems in the business process of an enterprise in a cross, we can overview these relationships. Until now, enterprise information systems have been centralized and distributed systems through the evolution of technology. In modern society, a concentrated type called "cloud" has become mainstream. Maintaining the latest state of the system at all times, improving efficiency, reducing investment, depending on circumstances by using different "cloud environments" inside the company and outside the company, to increase the confidentiality of critical information such as personal information and financial information. Moreover, due to the increase in storage capacity, it is now possible to accumulate business-related data that is updated every day as information system data. 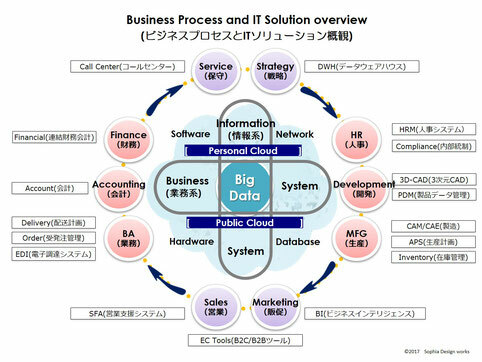 "Big data" can be said to be aggregates of all kinds of information such as fixed form / qualitative information gathered from POS, GPS, SNS etc., images and moving images. With the synergistic effect with analytical technology making use of AI, it will solve the problem of modern society. In that sense, modern society may be said to be the era of centralized information infrastructure. Speaking of the cross in the circle, that is the planet symbol of the "earth". The horizontal axis represents the equator and the vertical axis represents the meridian. In my case, when talking about the corporate information system, I will remind everything by imaging the earth in my head.